It's that time of year again — time to kick of our fall campaign! You might have known this event as the Sunset Soiree. 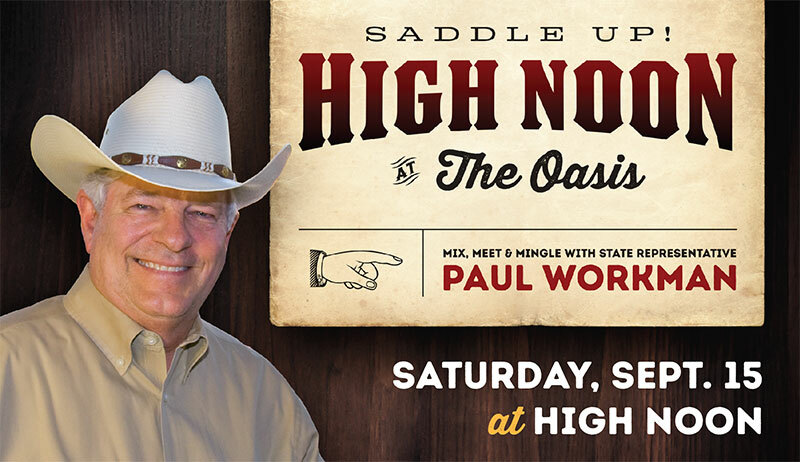 We changed the name and the time, but expect the same great experience as you mingle with friends and take in stunning vistas at Paul’s 8th annual campaign get-together at The Oasis. Saturday, September 15, 12:00 p.m. Questions: Contact Brian Mitchell at brian@workmanfortexas.com or (512) 850-4703. Pol. Ad. paid for by Workman for Texas, Sherry Workman, Treasurer.